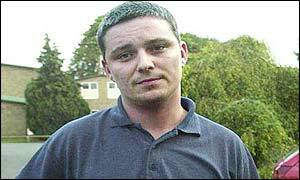 School caretaker Ian Huntley has been charged with the murders of Holly Wells and Jessica Chapman. The 28-year-old was also sectioned under the Mental Health Act 1983 in the early hours of Tuesday and moved to Rampton high security hospital in Nottinghamshire. Detectives drove to Rampton late on Tuesday afternoon to formally charge him with the murders. His girlfriend Maxine Carr, 25, a classroom assistant, has been charged with attempting to pervert the course of justice. Her charge was announced just before 2200 BST on Tuesday, and she has been remanded in custody pending an appearance at Peterborough Magistrates Court on Wednesday morning. Mr Huntley was also listed to appear in court, but doctors have ruled he is not fit to appear in person. His case will be listed "when he is deemed fit to attend", a Cambridgeshire Police spokeswoman said. The couple were arrested on Saturday, 17 August, almost two weeks after the 10-year-olds went missing from their homes in Soham, Cambridgeshire. Two bodies believed to be those of the little girls were discovered later that day, in a remote patch of woodland near RAF Lakenheath in Suffolk. In a statement, Rampton hospital said Mr Huntley was admitted "after concerns were expressed regarding his fitness to be interviewed by Cambridgeshire Police". Mr Huntley lived with Ms Carr in Soham and was site manager at Soham Village College. Ms Carr had been employed as a teacher's aide at Holly and Jessica's school, St Andrew's Primary. Detective Chief Inspector Andy Hebb said Mr Huntley's sectioning took place on the recommendation of a psychiatrist. This gives doctors 28 days to assess his condition. Eventually it will be up to the courts to decide if he is fit to stand trial for murder. In cases like this defendants can still be found guilty of murder, or guilty of manslaughter on grounds of diminished responsibility, or acquitted. A post-mortem has so far proved "inconclusive" on how the girls died, and police have said it might be some time before the cause of is established or they are formally identified. Officers are still searching Soham Village College, the couple's house and the home of Ian Huntley's father Kevin, in nearby Littleport. About 14,000 messages of condolence from the public have already been sent to a special website set up in memory of Holly and Jessica. Hundreds of mourners are still placing flowers, candles and cards at Soham's St Andrew's Church and elsewhere. "During the last few days there has been intense debate about Huntley's state of mind"